Our most recent refresh certainly had a retro focus, as we added two cool vintage-themed bass guitars – the Orange O-Bass and the iconic Hofner Ignition Vintage Violin Bass. We also said goodbye to two slightly older models for now – the Epiphone Thunderbird Pro-IV Bass and the Dean Edge 4. Buying an instrument of any sort is always tough when it comes to setting a budget. You always want to get the best you can, maybe squeeze a bit more money in there so you can grab the one with better pickups. This applies to shopping for bass guitars as well. With that in mind, there is that sweet spot where you can find the best balance of price and performance. Bass guitars in this segment bring the best you can get for your buck, and more, which is why we included some of them on our list of best bass guitars out there. For more info, check out the separate article. We have already talked about some models at the very edge of this category, which you can check out in our separate piece on that subject. A more comfortable place in this band is right around the $500 price point. 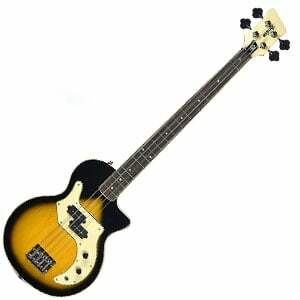 Bass guitars you can find here deliver the type of performance you can take on any stage, while also being reasonably priced. On that note, we did some digging and found six models which we think best represent what we are talking about here. If you are hunting for a good model that is still considered affordable but offers a whole new level of quality compared to the entry level selection, you’re in the right place. Let’s get started. Advanced features, impressive tone and overall strong core performance at affordable price. An evolution of the legendary J Bass platform that simply just works. Real retro style and huge tone from the British amp masters. A pretty rare active Squier that can take on competition with ease. An awesome axe built for high speed, precision, and heavy tone work. No list is complete without at least one Yamaha model on it. For this occasion, we have chosen the TRBX304 – one of the best bass guitars in the entire family. What you get with this awesome package is an instrument that works, and works well. There are advanced features, standard high-quality core performance, and pretty much everything that has made the TRBX line so popular in the first place. The bass sports that all familiar design that spans across the entire TRBX range. This particular model comes with two humbucker pickups which are active and a force to be reckoned with. The tone is very expressive, but also adjustable to your needs. Best of all, the price is simply too attractive to ignore. Whether you are into heavier genres of music or you are simply looking for a bass guitar that does it all, Yamaha TRBX304 is definitely a safe choice at the moment. Most people who aren’t that interested in the history of guitars will tell you that whatever fender offers now is the best Leo Fender had to offer. Needless to say, this is definitely not true. Leo left Fender quite early on only to form G&L – a company where he did some of his best work. The quality of G&L instruments is known far and wide, but so are their high prices. One of the models that sit comfortably in the mid-range is the G&L Tribute JB2. This bass brings everything we liked about Fender P-Bass, and combines it with Leo’s later ideas. Impressive build quality, timeless design, and bulletproof electronics make the JB2 a true performer. In terms of sound, you are looking at a force to be reckoned with. It brings the thump but also a delicious fat tone on demand. Thanks to its two G&L Alnico single-coil pickups, JB2 comes across as an upgraded version of a Fender P-Bass. Orange is an icon in the world of amps and cabs, but the famous British brand’s O-Bass is a statement that they can make a mean bass guitar too! Coming in at under $500, this vintage-soaked bass shows off huge value. There’s a lightweight single-cutaway body made of okoume with a basswood top, finished in a range of cool retro colors and sporting a striking white headstock. The O-Bass features just one pickup – a custom-wound split-coil humbucker – but that’s all you need for a big range of meaty, rich tones with a huge thump. Hardware is equally as impressive and leads to a reliable playing experience that’s begging to be plugged into a stack of Orange amps! 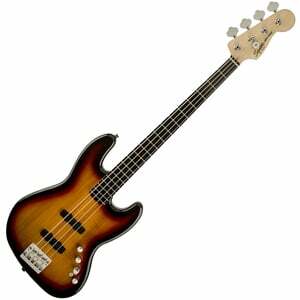 Check out our full review of the Orange O-Bass for all the details. Squire is most definitely not the instrument brand the majority of the bass players even consider when their budget exceeds $300. We have covered some of their models in the aforementioned range, and they are definitely rocking. But does this brand have what it takes to duel it out with more expensive basses? The answer is yes. Squier by Fender Deluxe Active Jazz Bass IV is all the proof you’re going to need. A well-built bass guitar that comes with a set of active single coil Jazz Bass pups is enough to make every bassist focus attention your way. In a lot of ways, this bass brings a lot of features that make Fender basses so good. Sure, it’s a simplified version but the tone is definitely there. No matter what you can read online, this particular bass guitar is more than capable bringing you a balanced, quality sound. Ever since they’ve blown up all over the world, Schecter has started producing some of the most stylish and capable bass guitars you can find. In the price range we are interested in, one of the bass guitars that really sticks out is the Schecter Stiletto Stealth 4. This axe has the looks, the sound, everything. Best of all? It’s comfortably under $500 at the moment. Some would even say it stands close to some of their bass guitars from the $1000 range. For more info on that price range, check out our special article on that subject. The only feature that has been brought into question about Stiletto 4 is the choice of tonewood. Schecter went with basswood for this model, and that sits wrong with some people even though basswood has been widely used in both affordable and premium guitars. With a set of active pickups and a pretty potent EQ section, Stiletto packs the type of sound you can do just about anything with. Naturally, this bass feels at home in metal territory, but it is pretty versatile. For the most part, Stiletto 4 punches way above its price range, and that isn’t all that surprising if you consider that Schecter cut down the price from high 600s. By all accounts, Schecter Stiletto Stealth 4 is the value option in this price range. 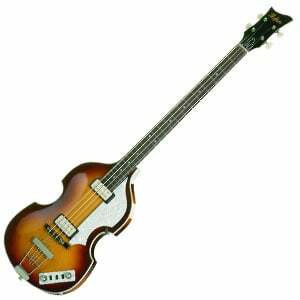 Just like John Lennon and George Harrison made Rickenbacker a household name, Paul McCartney turned Hofner’s 500/1 Violin Bass into the must-have bass of the sixties – and beyond! While only a rare few will enjoy playing on an original, those with a couple hundred bucks in their pocket can now enjoy this Ignition Vintage Violin Bass from Hofner. Although made in China instead of Germany, it shows off classic retro looks, with the symmetrical violin body made from spruce and flamed maple, along with a 22-fret maple/beech neck. It includes a set of Hofner Ignition Staple Nickel humbuckers for a warm vintage tone and performs very well for the lower-end of the sub-$500 range – as we mention in the full review. 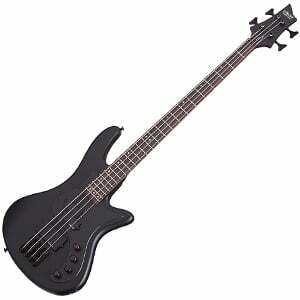 Finding a decent bass guitar in the $500 range is much easier than finding something cheaper. There are many models to choose from, and the plethora of features is much more complex. The guitars we have talked about today are definitely among the most capable you can find for this type of money. We tried to include a variety of different styles in an effort to help everyone find something they might like. When putting together our shortlist, the core criteria was performance, with sound and build quality a close second. Our aim was to line up those bass guitars that make you grin whenever you plug them into an amp and turn up the volume. Of course, not everyone will agree with the models we have decided to include here, but everyone has their own personal tastes and preferences. We hope you have found this short guide to be helpful in your search for a mid-range bass – whether it’s your first or your fifth!